AÃ”Ã‡ÃªNEW therapy to treat lung cancer has been developed by creating nanoparticles wrapped in polymers. The cancer kills more than a million people worldwide every year. The nanoparticles have been synthesised by trapping small interfering RNA (siRNA) in two biodegradable polymer molecules—polyethylenimine and poly (lactide-co-glycolide). A class of proteins, known as signal transducer and activator of transcription (STAT) proteins, causes unbridled growth of cancer cells. 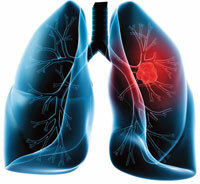 One such protein is STAT3 that contributes to a runaway growth of lung cancer cells. This is why the researchers set out to stop the activity of STAT3 protein. For this, they chose a specific siRNA that is known to selectively target and inhibit STAT3. They compared the activity of polymer-wrapped siRNA nanoparticles with that of naked siRNA on human lung cancer cells and carcinogen- induced lung tumours in mice. The results show that exposure to polymer-wrapped nanoparticles caused controlled death of human lung cancer cells while exposure to naked siRNA did not. In mice carrying carcinogen-induced lung tumours, treatment with nanoparticles inhibited the growth of tumours and reduced damage to lung tissues. The study found that the wrap of polymer molecules protects the siRNA against degrading cellular enzymes. Also, the polymer molecules help faster release of siRNA to target lung cancer cells. After a week of treatment, the nanoparticles reached the brain of lung-tumour-bearing mice, indicating that similar therapy could be used to treat brain tumour. “The combination of two biodegradable polymer nanoparticles easily delivered siRNA, an anticancer agent into cancer cells, making it an excellent anticancer drug-delivery system for combating lung cancer,” says Anisur Rahman Khuda-Bukhsh who led the researchers from the University of Kalyani, West Bengal. The study has been published online in Toxicology Letters on January 17.